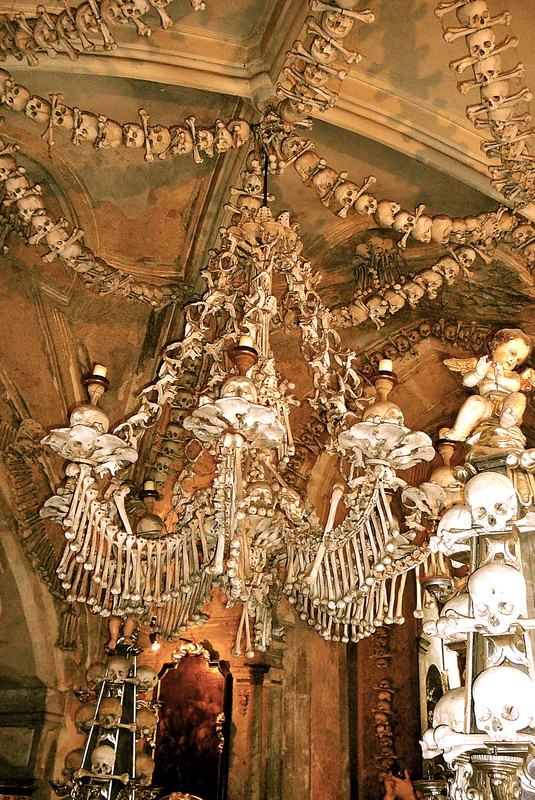 The Bone Church: the creepiest day trip from Prague! What? Bones in a church?? 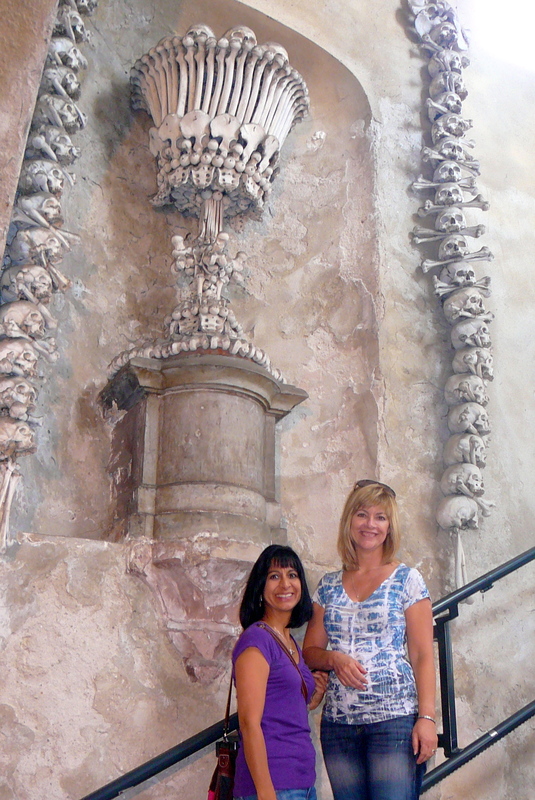 Last September we visited the “Bone Church” in Kutna Hora with my friend, Elsa. It was such a strange, creepy place! 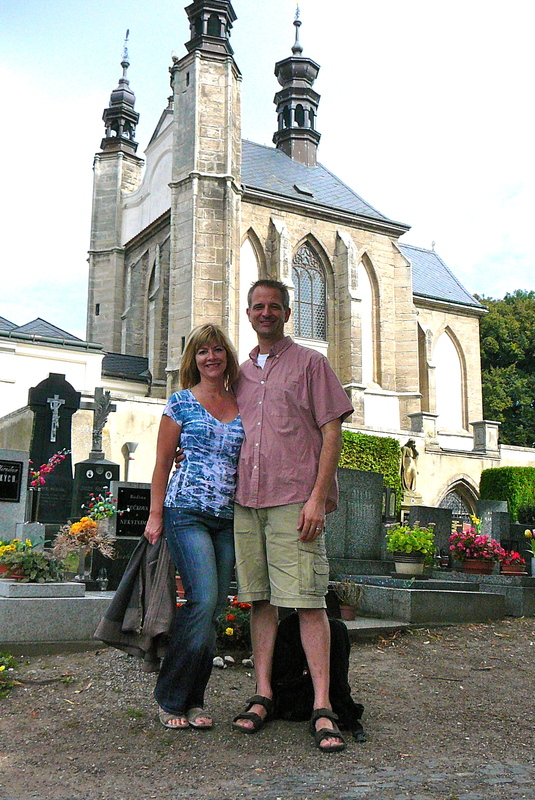 Ahhh, another quaint European church…not!! Looks can be deceiving. It looks picturesque and peaceful from the outside. But on the inside it is no ordinary church. 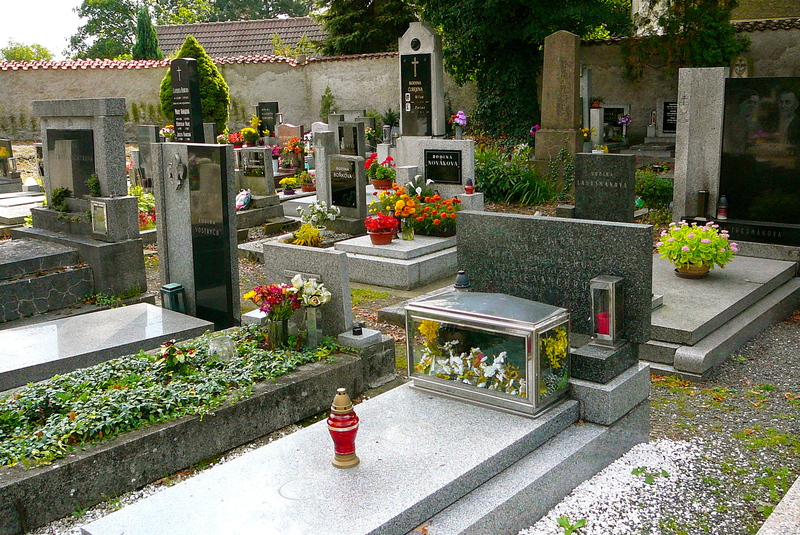 The graveyard on the church grounds. It looks as if the Adams Family decorated the church! All of the decorations inside the church are made from human bones. Seriously?? Seriously!! The next logical question is: Where did the bones come from? The chandelier contains every bone in the human body! The bones come from the victims of plague in the 14th century, and from victims of the Hussite wars in the 15th century. Thousands were killed in these events; apparently they were buried in mass graves on the church property. This is the coat of arms of the Schwarzenburg family, who used to own the church. Close up of the coat of arms above: worthy of Pirates of the Caribbean! Why so many bones in one place, you ask?? 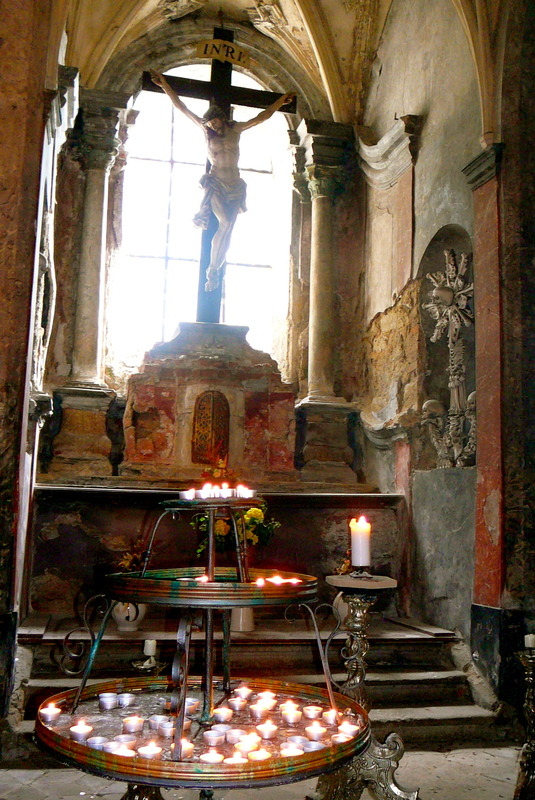 The legend goes that the abbot of Sedlec monastery, known as Jindrich, brought back a handful of soil from his travels to Palestine, and sprinkled it on the cemetery. 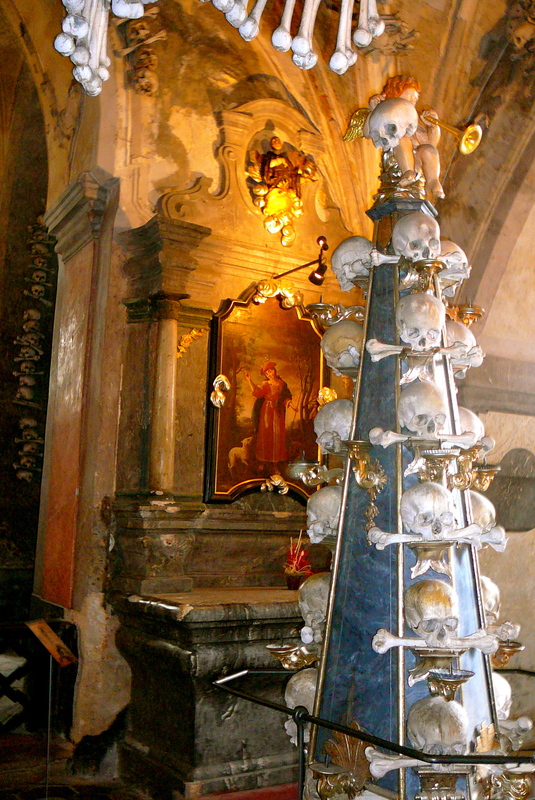 This made it a popular burial site for the nobility of Central Europe. The number of burials outgrew the available space during the Thirty Years’ War in the 17th century. So they began to dig up the older remains and stored the bones in the chapel. 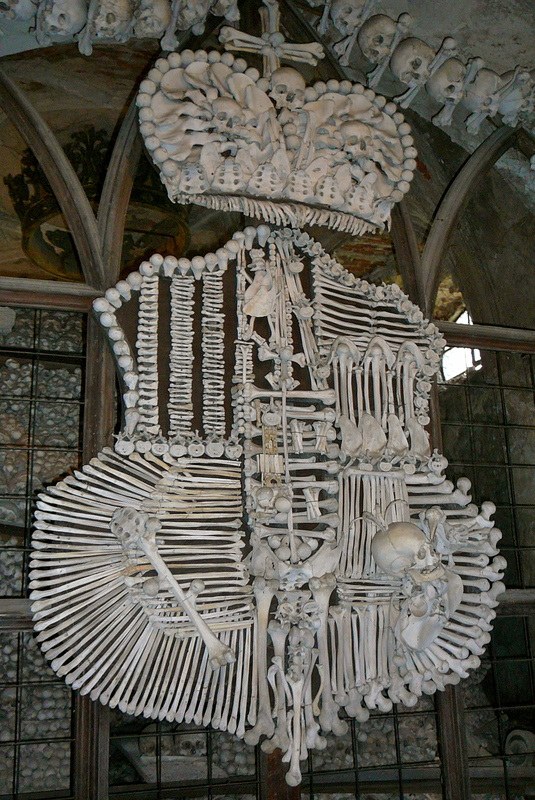 It is estimated that the chapel contains the bones of 40,000 people! 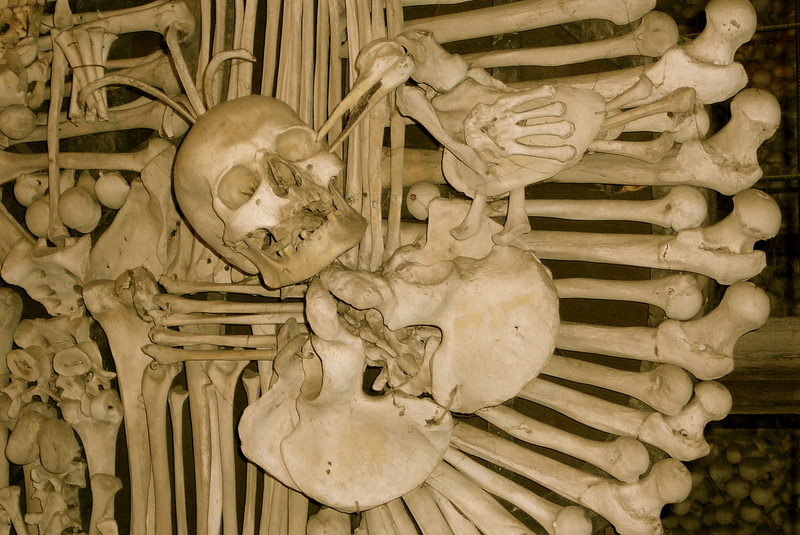 There’s an urban legend that a monk went crazy and made things from the bones. Another legend is that the bones were first piled in geometric shapes by partially blind monks who were taking care of the chapel. Sounds like an answer my nephew Aaron would make up while playing the game Balderdash (a game where you make up crazy answers to questions and try to get the other players to believe you)!! 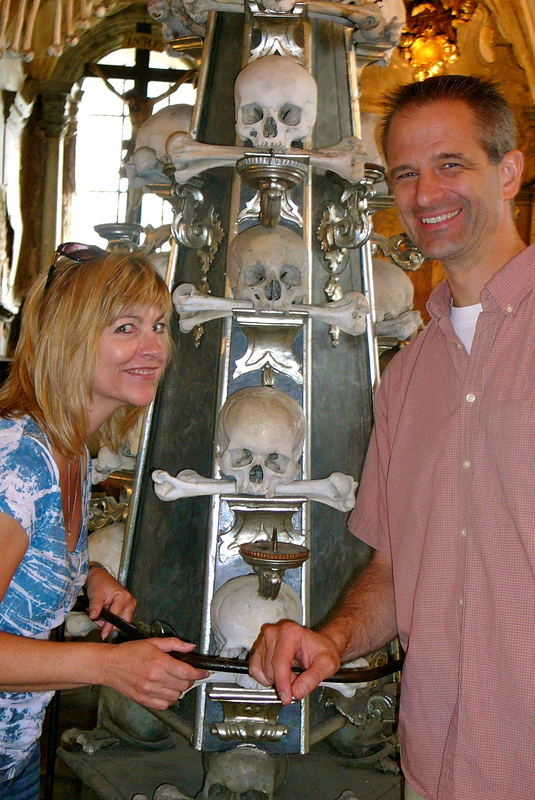 Smile for the camera while we pose next to a chalice made of bones surrounded by skulls: STRANGE!! A big thank you to my friend Elsa, for these photos. My camera battery had died on the way. After you leave the church, shake off the creepy feeling, and walk on to the picturesque town of Kutna Hora, a UNESCO World Heritage site. 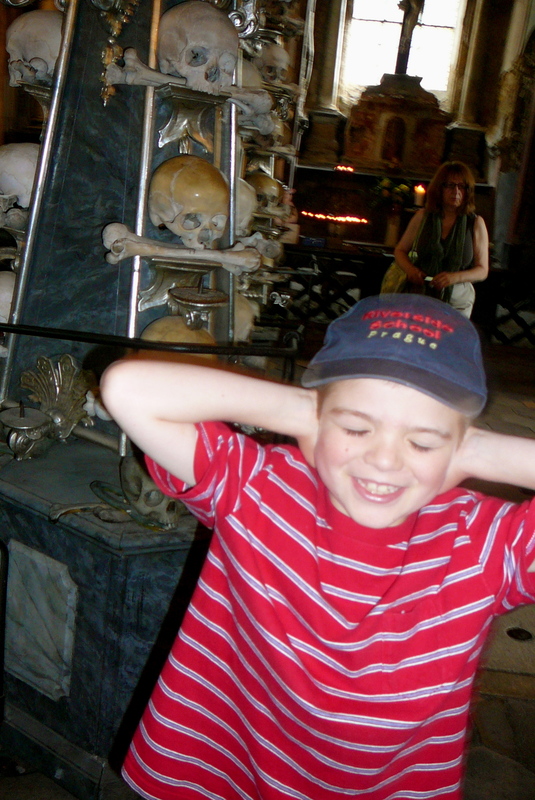 I’ll write another post to show the “lovely side” of Kutna Hora! While doing research for this post, I found this awesome quote by Greg, writer of Outside Prague, a great website about the lesser known towns and cities of the Czech Republic. “Visitors to the bone church often describe it as macabre, eerie or creepy and I once asked the lady at the desk if she ever felt bothered to be working there. She flipped her hand in a dismissive way and said “Pfft! They’re only bones, they won’t hurt you; it’s the living who scare me”.